Doux News is back! We've been on hiatus since last summer. That was mostly my fault. I was posting a lot of reviews and feeling burned out. So I'm willing to try again, with a couple of little changes. One, I plan to post less actual TV news and more personal opinion. Two, I'm asking our writers for contributions. And three, I may not post an issue every Sunday. On March 28, we're getting a super crossover when Grant Gustin's Flash (on the CW) crosses over to Supergirl (on CBS). Everybody loves a good crossover, and consider the possibilities: since the Flash exists in the same 'verse as Arrow and Legends of Tomorrow, there could be even more crossovers. Or more accurately, DC is deeply envious of the success of the Marvel Cinematic Universe and is playing catch-up a bit late in the day. They've already incorporated Constantine into Arrow. What about Gotham? Batman vs. Superman? Since both Grant Gustin and Melissa Benoist were on Glee, isn't everyone thinking duet? It would probably be a little difficult to write bursting into song into an action hero crossover, but wouldn't it be fun? As I've mentioned in my "Best of 2015", I'm sad that it took me fifteen years to try Gilmore Girls. Because I love it, love it, love it. I'm currently in the middle of season six, which means I'll be done in time for the revival that has just gotten the green light. That's like future wish fulfillment. I'm going to reach the end and long for more, and there it will be. The Gilmore Girls revival will now include Matt Czuchry (Logan) and the TVLine article hints that we might also be getting another Rory boyfriend or two, as in Milo Ventimiglia (Jess) and/or Jared Padalecki (Dean). Of course, I want Jared Padalecki, but does he even have the time? Clearly, the GG producers were great talents as far as casting is concerned, since all three of Rory's young boyfriends ended up starring in their own shows. What are the odds? While I'm asking, what's with Melissa McCarthy (Sookie)? There seems to be crossed wires or even bad blood about her appearing in the revival. I wonder why? Anyone know? Orange is the New Black just got renewed. Renewal for one season is always good news, but this was for three. Three more seasons. After the fourth season drops this June 17, we're going to get seasons five, six and seven. Wasn't Piper only supposed to be in prison for fourteen months? Deadpool, the first of several comic movies coming out this year, will be released this week. It is also one of the most anticipated for several reasons. The casting, tone, writing, costume, and character all look spot on. Early buzz is that the movie is surprisingly good. But that is not the strange part. Everything leading up to this movie has been almost perfect, from a marketing perspective at least. From the first reveal, to trailers, commercials, posters, videos, and a couple of oddly informative PSA's, all the marketing lead up has been pretty amazing, doing everything to play up the fact that this film is going to be different. So what is this movie about? Well, it's about one of the strangest and most perverse characters in comic books. A character that is basically a dark joke combined with potty humor, wrapped up in red spandex sporting swords, guns, and a healing factor that makes Wolverine look like he has a slow metabolism. A disfigured loudmouth who breaks the forth wall on a regular basis, and has a tendency to make a bloody mess of everything he touches. He is unique, and I can't believe there is a movie coming out that looks like it actually got him right. -- If you're a fan of The Walking Dead, you might want to set your DVR. Four cast members (Norman Reedus, Lauren Cohan, Danai Gurira and Steven Yeun, all favorites of mine) and two executive producers (Scott M. Gimple and Robert Kirkman) will be on Inside the Actors Studio on Thursday, February 11 at 8:00 on Bravo. I'm so there. -- Dougray Scott just scored a continuing role on Fear the Walking Dead, which returns this spring. I'm still planning to cover season two, by the way. 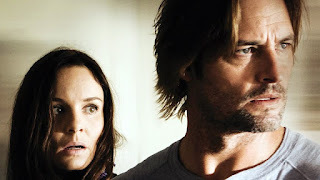 -- Colony already got a second season. Congratulations to our much loved Josh Holloway. I liked the first two episodes and have the third and fourth waiting on my DVR -- not because I don't want to watch them, but because my TV life is way busy right now. Speaking of busy, if you've ever been interested in writing for Doux Reviews, we have (sadly) lost a few of our long time contributors this past year for one reason or another. There are many current and classic shows that we'd love to cover, but we're now overcommitted. Although most of our writers have a show that is all their own to review, we're doing a lot more of what we call "round robins" these days. Like, five of us covered thirteen episodes of Jessica Jones in just two weeks, and we're hoping to do the same with the upcoming season of Orange is the New Black. We also do round robin reviews for Agent Carter, DC's Legends of Tomorrow, Star Trek: The Next Generation and The X-Files, and we've talked about round-robining Farscape and possibly Gilmore Girls. If you love TV, have a talent for writing that will fit in on our site, and are interested in joining us, here are the details. Let me add that producing a review or two a week is a lot of work, and it's not for everybody. But we have a terrific group of writers here at Doux Reviews. We're fun to be with. I promise. Bestselling science-fiction author John Scalzi might be most well-known for his books (the Old Man's War series, Redshirts, Lock In) or even for his battles with the far-right SF contingent. But I think--nay, I know--that he will go down in history as the man who created the cutest Twitter account in the world: @scamperbeasts. Their piercing gazes often stare directly into the camera, which is to say directly into the soul of the viewer. 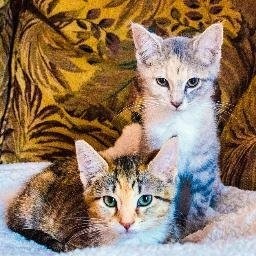 They vacillate between cute and domineering; their charisma and power seem to be growing as they effect the typically-tragic transformation wrought by time (that of turning kittens into cats). That's it for this week. What's new with you guys? I need to watch Arrow. And The Flash. And Supergirl. And Gilmore Girls, if only to have my head spin when people refer to Jared Padalecki as 'Dean'. And since this is our news page, if anyone's wondering, I am going to get back to West Wing and Voyager reviews, it just hasn't been possible lately. But they will return! Probably in the summer. I'm glad this regular post is back. I just wanted to second how great it is to write here. IMO, there are lots of commenters who I often think are really great writers. Do it, guys! I've been screaming for a musical episode of The Flash since the beginning. I mean, it had a landshark it can't have a musical episode? Meta-human whose power is to make everyone burst into song. Boom. Half-written. I will confess my desire to hear the cast sing has far less to do with Grant Gustin than with Jesse L. Martin. I can't believe Fear TWD is coming back. I recently watched the whole first season (it's on Hulu!) and I was bored out of my mind. I seriously had to force myself to keep going. It's like someone went "What if we did another Walking Dead but this time took out everything that people liked about the show?" I definitely agree about a Flash musical episode. There is no reason that can't happen. Jared Padalecki is not Dean? Anonymous, I gather you don't watch Supernatural? Juliette - When I first heard the rumors of a Gilmore Girls revival it was my wish to really make Gilmore Girls/Supernatural fans heads really spin. Bring back Dean (Jared Padalecki) but have him come to Stars Hollow (or wherever the revival is taking place) with a co-worker, hunting buddy (Bambi’s mother not Banshee), or brother-in-law (?) named Sam (played by Jensen Ackles). It will probably never happen, but a girl can dream. And if I'm not mistaken, there was an episode of supernatural that referenced Sam's past as Dean. They could just bring in Neil Patrick Harris to play a live action version of the Music Meister, his role in the Batman: The Brave and The Bold cartoon.